Bigorne is a two-horned (or beaked) anvil with both a flat and a rounded striking area. These anvils are used when placing hallmarks and assay marks on metal. From 1818 to 1984, the French instituted a system whereby they engraved their anvils with insects. 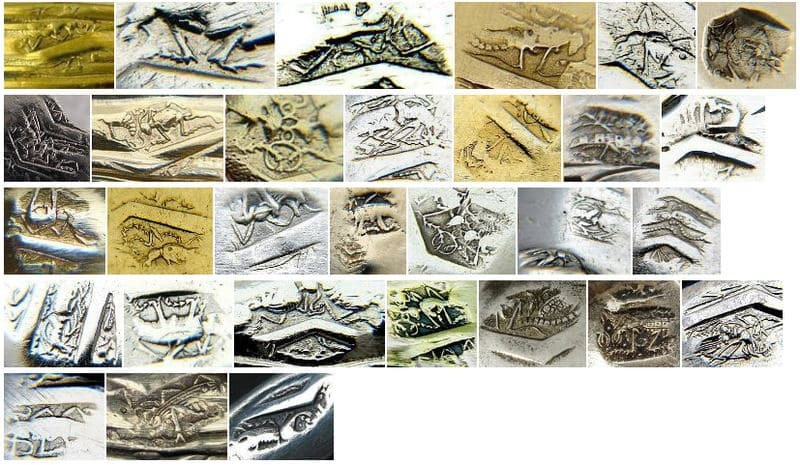 In the case of the small anvil used to mark jewelry, they were incised in a zigzag pattern depicting rows of insects. This specially engraved bigorne anvil was then used in a system devised to countermark hallmarks. The piece to be hallmarked was placed in position on the anvil and, when the punch was hit with the hammer to create the hallmark, the reverse (or anvil side) was impressed with the specially engraved bigorne pattern. This system was devised as a security precaution against counterfeit or transposed hallmarks. These marks can be very difficult to discern because of the intricate nature of the insect renderings. Three sizes of bigorne marks. All depicted randomly placed insects on a plain background. 1. Large Bigorne – Six different insects within frames (triangle, pentagon, etc.). 2. Medium Bigorne – Fewer insects than the large bigorne. Insects were aligned and bordered by zigzag parallel lines. There were different patterns for Paris and for the Provinces. The borders are patterned with tiny dots on the medium and the rounded end of the small anvil. The flat end of the small anvil has the letters C.O.N.T.R.E.M.B.U.R.E.A.U.D.E.P.A.R.I.S. and the rounded end G.A.R.B.U.R.E.A.U.D.E.P.A.R.I.S. 1. Large Bigorne -16 bands. 2. Medium Bigorne -13 bands. 3. Small Bigorne -17 bands on the rounded horn and 21 bands on the flat horn. Examples of French Bigorne Marks on Jewelry and Silver. 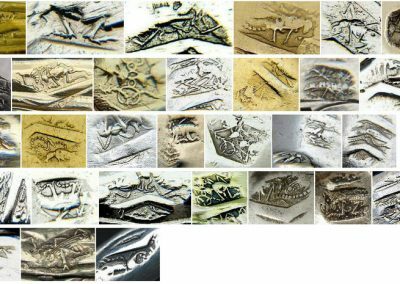 • Whetstone, William B., Niklewicz, Danusia, Matula, Lindy L. World Hallmarks: Volume I – Europe 19th to 21st Centuries. San Francisco: Hallmark Research Institute, 2010. p.101. • International Hallmarks on Silver Collected by Tardy, Paris, 1985. p. 212-213.